Polycom's GARKON composites are of Nomex® paper laminated on either side of Polyimide® film. 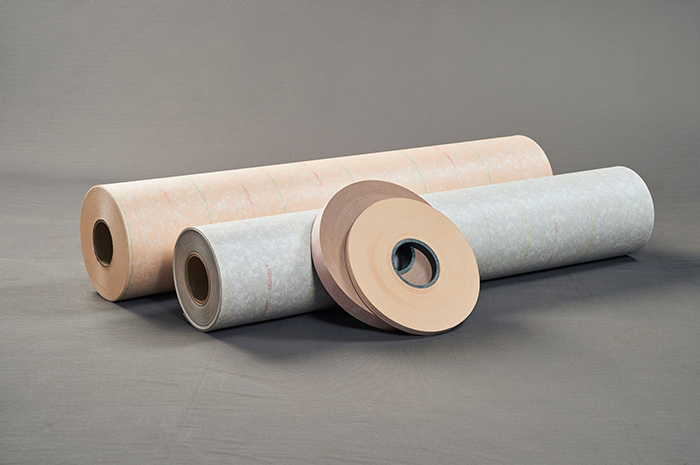 The lamination is achieved through high quality thermosetting adhesive. The excellent Mechanical, Thermal & Electrical values of Polyimide film are complimented with the very good chemical & Thermal properties of Nomex® Polycom's GARKON are produced in various combination. High dielectric strength even at high temperatures. Higher thermal endurance for prolonged periods. GARKON Composites are available in various forms such as sheets, rolls & narrow widths on request for various applications. GARKON can also be made available in 2 layers on request. Rolls of 910 MM. Tapes of width 8 MM above. Composites produced in various thicknesses ranging from 0.14 mm to 0.47 mm. We also supply fabricated components. Nomex® and Kapton are Registered Trandmarks of DuPont.